Click here to read it on the LVRJ: Las Vegas Review Journal: Talent Set in Stone… or continue to scroll down. 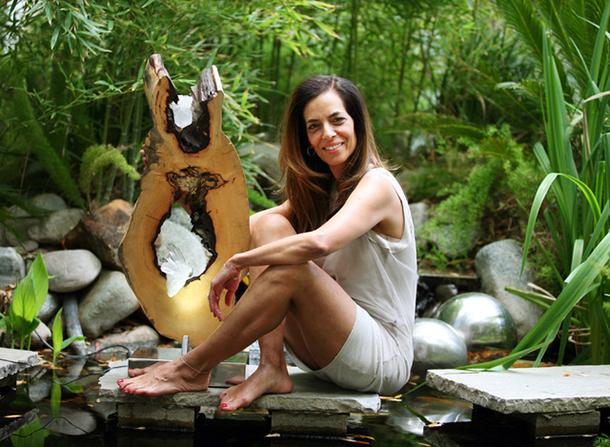 For sculptor Dorit Schwartz, her art is all about an appreciation for the organic beauty found in nature. 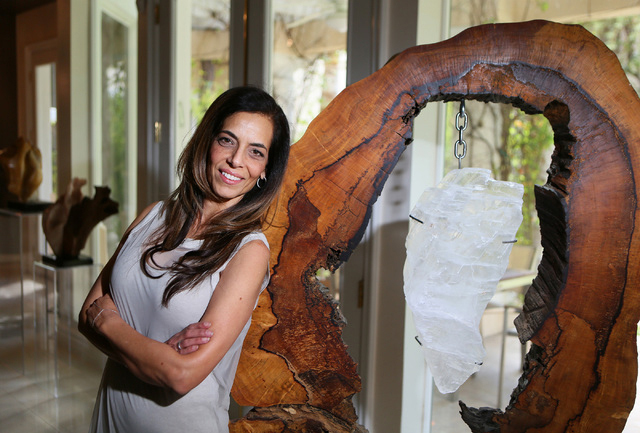 The Summerlin resident’s work will be part of the 30th anniversary of Southern California’s largest fine arts festival, the Mission Federal ArtWalk, scheduled for April 26 and 27 in San Diego. She was selected from more than 700 applicants to be one of 12 featured artists among the festival’s 350 artist participants. But Schwartz had a more local event on her mind when View visited. She is the co-founder of the local St. Jude Children’s Research Hospital chapter, which plans to host a black tie gala, Las Vegas Honors St. Jude: An Affair of the Art, at 6 p.m. May 3 at The Smith Center for the Performing Arts, 361 Symphony Park Ave. The event will support the efforts of St. Jude in the fight against childhood cancer and other deadly diseases. Schwartz was chosen to create the 2014 sculpture, of a mother and child titled “Celebration of Life.” It was re-created in fiberglass to be 5 feet tall and duplicated, so 10 artists could paint them. Each artist gave it their own interpretation. 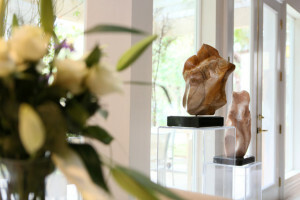 The sculptures will be auctioned off, with the proceeds going to St. Jude. Her own path to this point has seen her art evolve. Growing up, Schwartz studied various art mediums at the Wizo Art School in Tel Aviv, Israel, concentrating on art history and ceramics. Her family immigrated from Israel to the United States and settled in Los Angeles when she was 17. There, she met her husband, Ronnie, a developer. After moving to Las Vegas in 1995 and taking drawing classes at UNLV, she was introduced to alabaster marble. That’s where her “new love affair” started, she joked. That was about nine years ago. Then, about six years ago, she combined wood with the alabaster marble. At first, she crafted the alabaster marble to mirror the image of the wood from Indonesia and put the two halves together. Her later pieces saw the distinct wood — the more gnarled, the better — mirrored by sculpted alabaster marble. Merging the two opposites brings out the personality of a piece, she said, adding that she lets a piece lead her into how it should be sculpted. 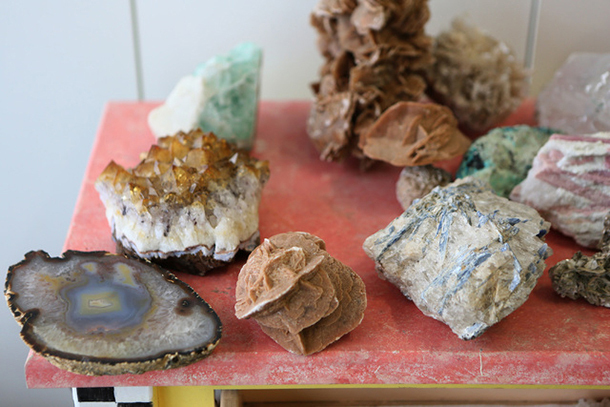 About two years ago, Schwartz began “The Light Within” collection, which uses crystals. She gives the pieces names such as “Spiritual Awakening” and “Unison.” Crystal is not as difficult to work with, she said, but it requires another universal component to bring it to life: its own spotlight. “When you see this piece sitting properly, you will see what will happen when the light will hit,” she said. Most of the time, she can be found at her home studio, working on her next piece. She tackles a handful of projects at a time, working on one until her mood changes. It can take months to compete a piece. 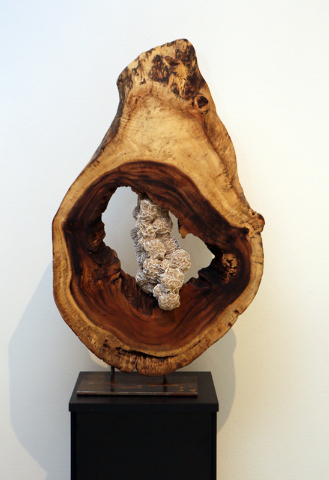 Lately that has evolved to placing crystals inside the wood for her “The Light Within” series. Her largest piece is about 4 feet wide by 6 feet tall. Her work starts at about $4,000. She also has experimented with other materials such as desert rose from the Sahara Desert, a type of gypsum crystals formed in connection with sand. Dorit Schwartz’s artwork is set to be featured at Las Vegas Honors St. Jude: An Affair of the Art, scheduled for 6 p.m. May 3 at The Smith Center for the Performing Arts, 361 Symphony Park Ave.
Tickets are $250. For tickets, visit: stjude.org/lasvegas. 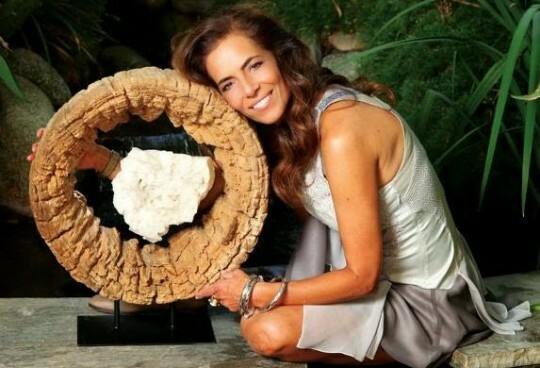 For more information about her work, visit doritschwartzsculptor.com. From my heart to yours, Happy Holidays!